Swamp white oaks are an excellent wet land tree which will grow in moist to swampy soils and in dry uplands. Swamp Whites will grow to 60' with an equal spread. Zone 4-8. The fall leaf color is Copper, Red orYellow. Swamp White Oak is native to wet places in the north central portion of the U.S. east to Maine and North Carolina. 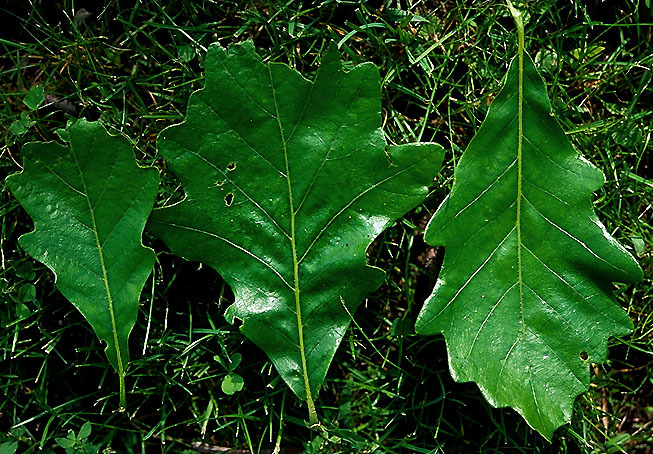 Swamp white Oak is an excellent nut producer for deer, turkey and other small animals. It thrives in soil that remains covered with several inches of water for weeks at a time. Swamp White Oak are found in the wild along streams and in swampy soils, Swamp White Oak should be grown in full sun to partial shade on acid soils, because severe chlorosis occurs on alkaline soils. These trees are very long-lived, surviving for more than 300-years. They tolerate soil compaction, drought and some salt exposure. They should be tried more often in urban areas. Swamp White Oak are moderately difficult to transplant due to the tap root. If you plan to grow and move a Swamp White Oak you might find you want to try our root bags for ease of digging and survival. Swamp White Oak is native to the following North American places: Connecticut, District of Columbia, Delaware, Iowa, Illinois, Indiana, Kansas, Kentucky, Massachusetts, Maryland, Maine, Michigan, Minnesota, Missouri, North Carolina, New Hampshire, New Jersey, New York, Ohio, Pennsylvania, Rhode Island, Tennessee, Virginia, Vermont, Wisconsin, West Virginia but will grow through most of the USA. We also have: Burr English Oak, English Oak, Willow Oak, Chestnut Oak, Columnar English Oak, Shumard Oak. White Oak, Swamp White Oak, Pin Oak, Northern Red Oak, Heritage Oak, Regal Prince Oak, Rocky Mountain White Oak, Oregon White Oak, Burr gambel Oak, Scarlet Oak, Northern Pin Oak, Bur Oak, Chinkapin Oak seedlings. To buy or check prices on Swamp White Oak seedling or transplants click on the drop down menu below. To order Swamp White Oak seedlings by PHONE: We're glad to take your order by phone. For your convenience, we have a toll free number 800 568-9179. Phone orders can be charged to VISA, or MasterCard accounts.